Third Generation ... The Lovely Family has been a fixture in the Foxborough community for decades. The family started a real estate business in the 1950s. Recognizing the natural connection between real estate and insurance, then family added real estate development companies and Lovely Insurance in 1973. John Lovely, a licensed attorney since 1986 focusing in real estate and business law, adds another complimentary dimension to an already impressive array of services. Attorney Lovely and his brother, Jeff, also an attorney, have acquired the family business and now continue the tradition of excellence started many years ago as principals of The Lovely Group. 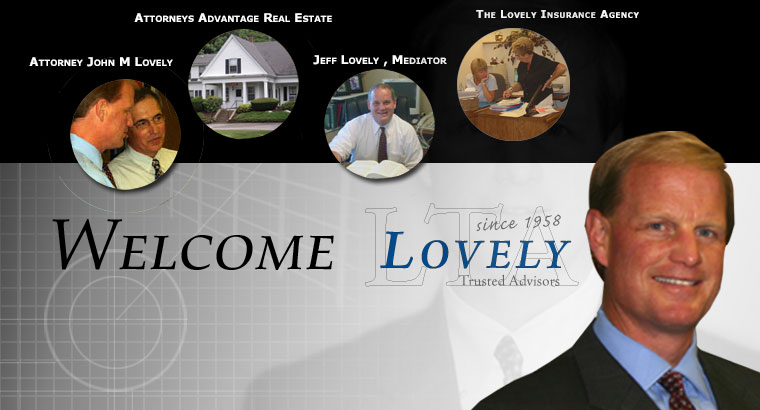 Whether you need assistance with a legal matter, insurance or real estate, Attorney John Lovely will put his many years of hands-on experience to work for you today. Contact John today. There is never a charge for an initial consultation.